Peacock (Pavo cristatus), which is a symbol of grace, joy, beauty and love is the national bird of India. Peacock occupies a respectable position in Indian culture and is protected not only by religious sentiments but also by parliamentary statute. The Indian peacock is a colorful, swan-sized bird with a fan-shaped crest of feathers on its head, a white patch under the eye and a long-slender neck. The male peacock is more colorful than the female one. The male peacock has a glossy blue breast and a magnificent bronze-green colored tail of around 200 extended feathers. The female peacock is brownish, slightly smaller than the male and does not have a tail. 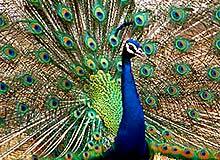 The dance of the male peacock by fanning out the tail and shaking the feathers is a treat top watch. In India the peacock is found in almost all parts and enjoys full protection under the Indian Wildlife (Protection) Act, 1972.